In one sense, there is nothing ‘incorrect’ about it. All of the sounds, or ‘phonemes’ to use the jargon, are in the right order and everything has been pronounced accurately. But, of course, the phrase has no meaning and the child is therefore conveying no meaning whilst speaking it. Speaking is clearly more than simply the rote regurgitation of ‘correct’ sounds. At West Bay University, most of our education research involves finding out what pre-service teachers’ attitudes are to various aspects of education. We are not alone; this exercise dominates research across the field and with very good reason. We wish to discover whether pre-service teachers approach their vocation with constructive or destructive informal pedagogies; whether they believe in authentic, contextualised, real forms of learning or whether their own childhood experiences have locked them into paradigms of rote memorisation. Our research into attitudes towards the teaching of speaking shows that many pre-service teachers haven’t even considered it! This shows the emphasis that society has previously placed on this crucial area – none! Here at the Extraordinary Learning Foundation™, our mission is to change all that. Moving on from our first phrase – where meaning was clearly absent – I wish to now present a more complex and nuanced example. Imagine if a child in Grade 2 were to declare the following. What would you think now? You might be inclined to suppose that this child was ‘smart’. Yet, the work of the German psychologist Edmund Rotz shows us clearly that a child at this stage of development could not possibly associate appropriate meaning to such a phrase. In actuality, what we are witnessing is rote verbalisation without meaning. The child has no idea what she is saying. I am speaking to Haneck von Beer about his approach to speaking for meaning with his Grade 4 class. Haneck works at the Grunig Institute and it is the lunch recess. All of Haneck’s class have eaten their lunch and are out exploring their ideas in the imaginarium resources area. This is, indeed, a common problem. 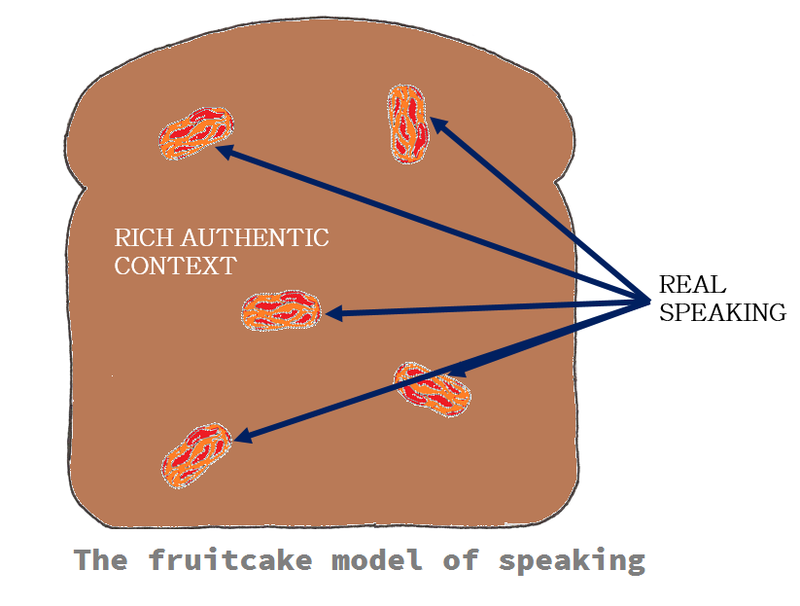 I smile, I can see where this is going and how the principles of the fruitcake model will apply. “George says that he has a cat,” Continues Haneck. “So I ask him to talk about his cat. For the first time, I heard George speak in a real, authentic, appropriately situated, meaningful way.” Haneck smiles. If only all educators had such skills! “What did George say?” I ask, totally subsumed in this moment of genuine authenticity. If laughter is the best medicine then bring on more of this! !